Mechanical Repairs, Tyre Service, Marshall Car Batteries, Hayman Reese Towbars, Hire Trailers, Hire Utes and Vans, with full service station service with driveway attendants available 7 days per week. We have a driveway attendant on the driveway to be of assistance to fuel and check your vehicle. Have a disability, we are there to help you. 7 days per week Mechanical workshop and Tyre Service Centre available, with Marshall Battery and Hayman Reese mobile and roadside service. 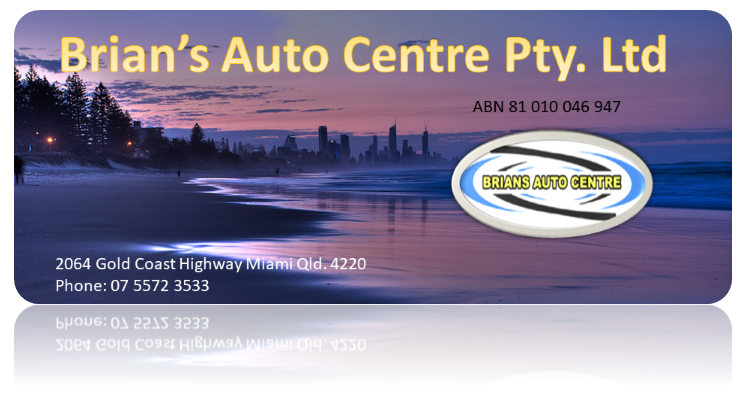 Brian’s Auto Centre offer a full driveway service, the only service station on the Gold Coast to offer this service as we expected in years gone by, 6 days per week. Mechanical Services available 7 days per week. Miami Towbars is the authorised Hayman Reese stockist on the Gold Coast. Miami Tyres has a 7 day per week service, 8am to 5pm. Brian’s Auto Hire for trailers and utes is open 24 hours / 7 days per week. Marshall Batteries available with roadside assistance. Brian’s Auto driveway service available 6 days per week. Marshall Battery Service is now available 24 hours, 7 days per week at Brian’s Auto Centre, 2064 Gold Coast Highway Miami Queensland. We offer car battery replacement service as well as roadside assistance. Miami Towbars is the Gold Coast authorised Hayman Reese stockist, offer a 5 day per week service from 8am to 5pm for all Hayman Reese products and accessories. Miami Towbars also offer a mobile installation service in the Gold Coast region for towbar supply & installation, as well as electric brake control installs, weight distribution setup, and those electrical accessories you may require for auxiliary power supply for camping requirements. Miami Tyre Service offers a 7 day per week tyre service including Sunday from 8am to 5pm. Miami Tyres will take care of all your tyre requirements, including puncture repairs, rim safety inspections, tyre technical advise as well as tyre recommendations for your vehicles terrain and tyre wear irregularities. A full wheel alignment service is also available. Brian’s Auto Hire, Trailer Hire / offer trailer hire on the Gold Coast from a fleet of over 50 hire trailers for short or long time hire. The trailer hire service is available 24 hours per day, 7 days per week with the best rates on the Gold Coast. Brian’s Auto Hire / Ute & Van Hire, offer Ute and Vans for short or long term hire on the Gold Coast from a fleet of Toyota and Mitsubishi utes and vans. All hire utes are Toyota Hilux tray back vehicles with the option of a carry bar fitted to the rear tray. Brian’s Auto Centre Mechanical Service Division is available 7 days per week from 8am to 5pm which includes Sunday mechanical repairs. Our”A” mechanics offer car repair services or general service facilities for your vehicle, as well as advise you on all your mechanical requirements. Brian’s Auto Centre offer a range of hot food and Coffee, as well as cool drinks, confectionery as well as shop and groceries also available. A driveway service is also available 6 days per week. Call now and inquire about our 7 days / 24 hour service available for your convenience.